In order to live, a parasite must find its host. Whereas some parasites take a passive approach and simply wait for a chance encounter, many species are more proactive. In the case of parasitoid insects that have free-flying adults, they have various adaptations for tracking down their hosts. But what about the hyperparasites - parasites that infect other parasites? How do they find their host, which themselves are hidden within the body of a host animal? It seems as if they would need to have X-ray vision in order to complete their life cycle. The parasite we are featuring today is Lysibia nana, a hyperparasitoid that infects Cotesia glomerata - the parasitoid wasp which lays its eggs inside caterpillars. It turns out that L. nana does not rely on superpowers like X-ray vision, but a far more parsimonious ability. To find out how L. nana finds a host, first of all, we have to ask; how does C. glomerata itself find its hosts? A few months ago, we featured a parasitoid fly that uses sound to track down its prey, but most parasitoid wasps use scent to sniff our their hosts. But this scent does not come directly from the host itself, but rather, the host's food. 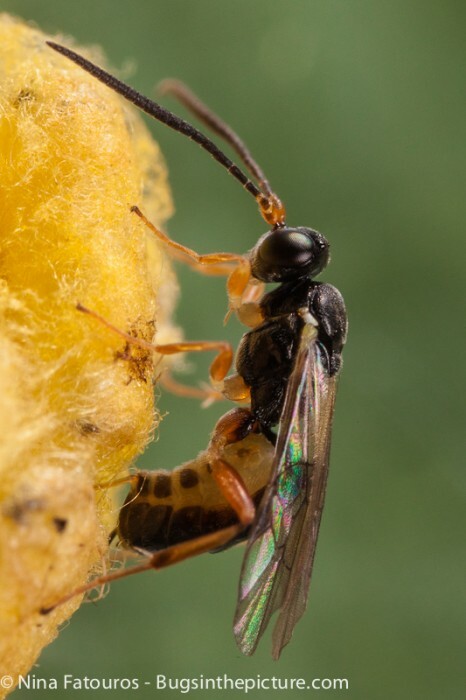 When a plant comes under attack by herbivores like caterpillars, they emit volatile chemical signals call kairomones that acts like a dinner bell for parasitoid wasps, which have evolved to use those chemicals to guide them to their prey. Feeding by different species of caterpillars elicit different chemical emissions from the plant, which provides a signature of their presence and attract different species of parasitoids. Parasitoid wasps are master body-snatchers, they don't just consume their hosts from within; while they are in residence they also change the caterpillar's physiology, altering its growth pattern and behaviour - so much so that on some levels the parasitised caterpillar can be considered as almost a different animal. But they have their own enemies in the form of hyperparasitoids like L. nana. A research group in the Netherlands conducted a series of experiments to figure out how this hyperparasitoid tracks down its hidden prey. They first tested how wild cabbage plants responded when they come under attack by two different species of caterpillar - Pieris brassicae and P. rapae. They found that two caterpillars induce very different blends of chemical volatiles from the plant. But it is a different story when those caterpillars are parasitised by C. glomerata. The physiological alteration that the parasitoid imposed on their host was reflected in how the caterpillar's food plant responded. Cotesia glomerata manipulated their hosts to such a degree that once parastisied, both P. brassicae and P. rapae elicited a far more similar blends of chemical emissions from the plant. This is where the hyperparasitoid L. nana comes in. The researchers put some female hyperparasitoids in a Y-maze and exposed them to combinations of different volatile chemical released by; caterpillar-free plants, plants which had been chewed on by caterpillars, or plants which have been chewed on by parasitised caterpillars. They noticed that given the choice between the chemicals of plants damaged by parasitoid-free and parasitised caterpillars, the hyperparasitoids preferred overwhelming to go in the direction of the latter - regardless of what species the host caterpillar might be. To L. nana, whether those caterpillars had parasitoid babies onboard is far more important than their species identity, and they showed no clear preference for either caterpillar species as long as they were parasitised by C. glomerata. So while parasitoid wasps like C. glomerata may have masterful control over their host body's physiology, this also leaves a calling card to their own hyperparasitoids. For the hyperparasitoids, it's what's inside that counts. Zhu, F., Broekgaarden, C., Weldegergis, B. T., Harvey, J. A., Vosman, B., Dicke, M., & Poelman, E. H. (2015). Parasitism overrides herbivore identity allowing hyperparasitoids to locate their parasitoid host using herbivore‐induced plant volatiles. Molecular Ecology 24: 2886–2899. P.S. I will be attending the New Zealand Society for Parasitology and Australian Society for Parasitology joint conference in Auckland, New Zealand. So watch for tweets with highlights from conference at my Twitter @The_Episiarch! All tweets related to that conference will have the #NZASP15 hashtag. Today we feature a guest post by Katie O'Dwyer who recently completed her PhD at the Evolutionary and Ecological Parasitology group at Otago University. She has previously written for Parasite of the Day about Phronima - a parasitic crustacean that turns gelatinous salps into floating zombies. This time she has written a story about why "Promiscuous ladybirds pay the price when it comes to parasites". For most of us when we hear any mention of sexually transmitted infections (STIs) we think of humans, herpes and the variety of public service announcements we see about practicing safe methods in order to avoid contracting STIs. However STIs are rife in the animal kingdom. They can be found in any animals that require internal fertilisation for reproduction. And it seems that one group which can really benefit from advice on safe methods to avoid STIs are the ladybirds. Who would have known (well, probably some entomologists) that these beautiful beetles are highly promiscuous and not very choosy about who they mate with? This makes them an extremely efficient host for any sexually transmitted parasite. Today’s post is about a sexually transmitted mite Coccipolipus hippodamiae and its host - an European ladybird. These mites are transmitted when ladybirds are mating and they migrate to the wing case (called elytra) of the beetles. Here they latch on using their mouthparts and feed on the hosts blood (known as haemolymph) before metamorphosing into adults. What quickly follows is the development of a large mite colony on a single ladybird. The presence of these mites can reduce the fertility and reproductive capacity of female ladybirds. 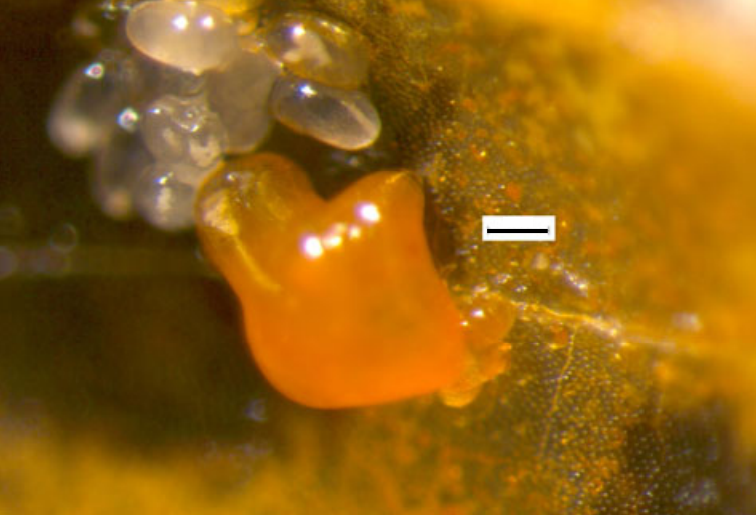 A female Coccipolipus hippodamiae mite with eggs. There are some measures that can be taken when faced with high levels of STIs, such as switching the mating system to monogamy and being choosier when it comes to potential partners. However, studies have found no evidence for C. hippodamiae having any effects on mate choice in ladybirds. Luckily for the mites, female ladybirds are unable to detect if their male partners are infected. However, there are other factors that limit the success of these parasites. Timing is an important aspect of STI transmission in this system. Ladybirds overwinter and refrain from mating regularly during this season. Following the period of overwintering, these highly promiscuous bugs travel across plants on a mating spree, hooking up indiscriminately, and triggering an epidemic of mite infections. A key aspect in this process is the overlap between generations. In order for the mite population to be maintained mating must occur between consecutive generations of ladybirds. The mites have evolved to take advantage of those hosts with overlapping generations and unfortunately for the two-spot ladybird, Adalia bipunctata, it has one of the longest periods of overlap between generations. Therefore it is also the most common host for these mites. These miniature mites have also adapted to infect other ladybird species with up to four species of European ladybirds in its repertoire of hosts. Interestingly, one of these ladybird species does not have an overlap in generations because a period of diapause is required during development, whereby one generation dies off before the next one metamorphoses into adults. Luckily for the mite, these ladybirds appear free and easy when it comes to mating, even across different species. So even this ladybird species without overlapping generations can become reinfected during such hybrid mating sessions.